Home > FDNY has it ALL! FDNY has been instrumental in the development of our most popular Hazard House Model, the Large Group version. In 2005, they were joined by the PHILLY FD, PA & DE State Fire Schools as a focus group. After more than 10 years of loyal services, these fire safety props have retired and were replaced by brand new units, even more specialized. 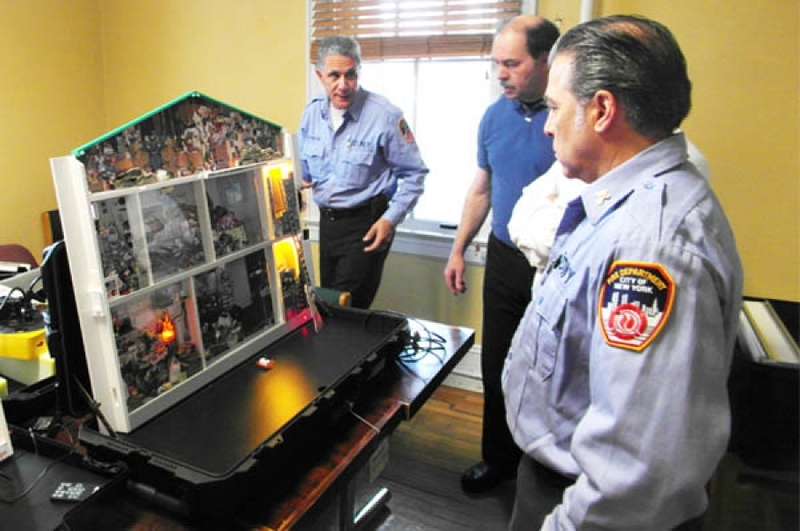 Since 2015, we have worked with Lt. Anthony Mancuso, Executive Director of Fire Safety Education to develop multiple new fire safety awareness simulators, such as the Hazard Apartment, its unique link to the Hazard Kitchen, the Hoarder’s Home, and more recently, the Hazard House Compact version (including the Gas option). The idea was to diversify their fire safety props fleet. Instead of having half-a-dozen identical simulators – used mostly in schools – they could now rely on more specialized fire safety education props for other audiences, such as senior centers, apartment groups, hard of hearing groups, safety days and fire prevention week events, etc. The FDNY was so pleased with those new fire safety simulators that they referred Modeltech to NYC Health Dept. for the development a new simulator teaching safe practices for a healthy home: how to avoid poisoning, moths, bed bugs, etc. For the first time in its long history, Modeltech will introduce the use of scanners and barcodes, allowing ultimate interaction between the audience and countless safety messages included in this 3D/multimedia marvel. Stay tuned for the upcoming integration of this new technology into our full line of products! Lt. Anthony Mancuso teaching fire safety tips to a young audience using the Hazard Apartment safety prop at Rockfeller Plaza. Lt. John Errico & Lt. Anthony Mancuso, Executive Director of Fire Safety Education for FDNY in front of the new ”Hazard Apartment” fire awareness prop.